Attributed to Albert Einstein. Possibly paraphrased from remarks in "On the Method of Theoretical Physics", Herbert Spencer Lecture, Oxford (10 June 1933), Philosophy of Science, Vol. 1, No. 2 (April 1934), pp. 163-169, p. 165. When true simplicity is gain'd To bow and to bend we shan't be asham'd, To turn, turn will be our delight 'Till by turning, turning we come round right.  Joseph Brackett, Simple Gifts (1848). Simplicity is the final achievement. After one has played a vast quantity of notes and more notes, it is simplicity that emerges as the crowning reward of art.  As quoted in If Not God, Then What? (2007) by Joshua Fost, p. 93.  Interview in Harper's Bazaar (1923). The rose has told In one simplicity. That never life Relinquishes a bloom But to bestow An ancient confidence.  "Tadmore", Venus Invisible and Other Poems (1928). Simplicity is the shortest path to a solution.  "The Simplest Thing that Could Possibly Work" (19 January 2004). Perfection is attained, not when no more can be added, but when no more can be removed.  Richard Feynman, The Character of Physical Law. Generally nature hangs out a sign of simplicity in the face of a fool.  Thomas Fuller, The Holy State and the Prophane State (1642), Of Natural Fools, Maxim I. To me more dear, congenial to my heart, One native charm, than all the gloss of art.  Oliver Goldsmith, The Deserted Village (1770), line 253. The greatest truths are the simplest: and so are the greatest men.  J. C. and A. W. Hare, Guesses at Truth; reported in Hoyt's New Cyclopedia Of Practical Quotations (1922), p. 710. If you wish to be like a little child, study what a little child could understand — nature ; and do what a little child could do — love .  In notes of August 1842, published in Charles Kingsley : His Letters and Memories of His Life (1883) edited by Frances Eliza Grenfell Kingsley, p. 65. Meryon succeeded in reaching the heights of his art, and achieved both splendour and simplicity through breadth of vision allied to technical skill.  Claude Roger-Marx, Graphic Art : The 19th Century (1962), p. 86. Our life is frittered away by detail. 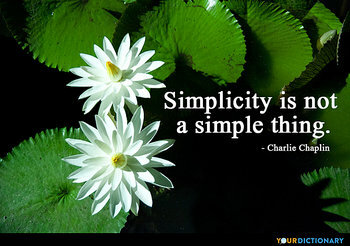 … Simplicity, simplicity, simplicity! I say, let your affairs be as two or three, and not a hundred or a thousand; instead of a million count half a dozen, and keep your accounts on your thumb-nail. … Simplify, simplify.  Henry David Thoreau, Walden (1854), Ch. 2 : Where I Lived, and What I Lived For. Simplicity is a state of mind.  Charles Wagner, Simple Life (1895), Chapter II. A man is simple when his chief care is the wish to be what he ought to be, that is honestly and naturally human. Humanity lives and always has lived on certain elemental provisions.  Charles Wagner, Simple Life (1895), Chapter III. To gain freedom is to gain simplicity. If our love were but more simple, We should take Him at His word; And our lives would be all sunshine In the sweetness of the Lord. "Blessed are the poor in spirit." Blessed are they who are stripped of every thing, even of their own wills, that they may no longer belong to themselves. Simplicity and purity are the two wings by which a man is lifted above all earthly things. Simplicity is in the intention — purity in the affection. Simplicity tends to God,— purity apprehends and tastes Him. Simpler manners, purer lives; more self-denial; more earnest sympathy with the classes that lie below us, nothing short of that can lay the foundations of the Christianity which is to be hereafter, deep and broad. If you wish to be like a little child, study what a little child could understand nature ; and do what a little child could do love . Simplicity the art of maximizing the amount of work not done is essential. Simplicity and purity are the two wings by which a man is lifted above all earthly things. Simplicity is in the intention purity in the affection. Simplicity tends to God, purity apprehends and tastes Him.